Kanban is really easy to implement no matter how complicated the process is. Take a look at our Kanban examples for some inspiration. 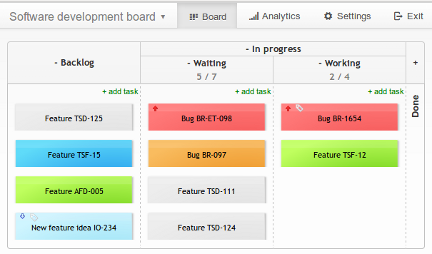 Then, create your first Kanban board with predefined board template. Getting started with Kanban is easier than you think! To do to store and organize things you want to work on. In progress with limit to keep you from multitasking. Done for reference and to track your performance. You plan your work in a time based manner? Time driven workflow is perfect replacement for your calendar. 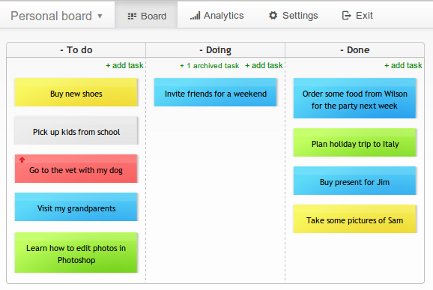 Using Kanban board you can prioritize your work and schedule it for next months, weeks and days. Visualize your goals and monitor the progress with insightful Kanban analytics and metrics. 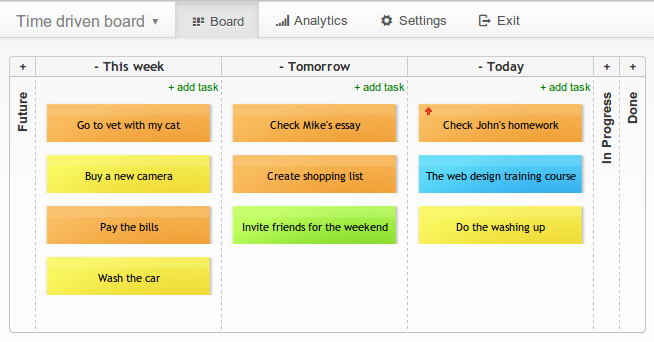 This example of Kanban board works best if some external events determine which tasks are ready to be worked on. It is the most widely used board template in lean and agile software development teams! Try it together with Kanban Tool's seamless time tracking.